"Social Action" does not refer to parties or social outings. Rather, it represents a personal commitment to contribute, either financially or through voluntary service, for the greater good of the community. As a member of Temple Emanuel, you can be part of the process of Tikkun Olam: healing the world. Here are the many ways we are involved in helping the community. The Temple Emanuel Social Action Committee is responsible for collecting Tzedakah funds to assist those in financial need, whether in the Roanoke Valley, throughout the United States, in Israel, or in other parts of the world. The Caring Committee consists of a group of congregants who serve to meet the needs of families within the Temple who could use a helping hand. Through Mitzvah projects, young people at Temple Emanuel also contribute to Tikkun Olam. Learn more. Temple members have responded generously to the ongoing crisis in Darfur, the Haiti earthquake in 2010, and Hurricane Katrina in 2005. Learn more. Temple Emanuel congregants have a deep and enduring connection with the State of Israel. Read more. 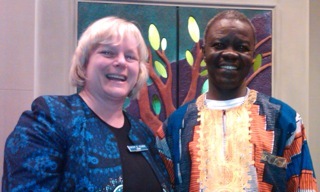 Shown here with Rabbi Cohen is David Bako, an Episcopal priest from South Sudan. The Darfur Action Committee sponsored Bako's appearance at Temple Emanuel in April 2010. Photo courtesy of Mim Young. The Temple Emanuel Social Action Committee is responsible for collecting Tzedakah funds to assist those in financial need, whether in the Roanoke Valley, throughout the United States, in Israel, or in other parts of the world. Each year the Committee recommends and the Temple Board approves various charitable organizations to receive funds from congregant contributions to help those who are hungry, who cannot read or write, who are homeless from a natural disaster or genocide, who are ill and cannot afford medical treatment, who suffer from domestic violence, or who otherwise are in dire need of financial assistance. Each time you visit Temple Emanuel, especially after a Shabbat or other holiday service, look for the Tzedakah Box at the entrance to the sanctuary, and contribute whatever amount you can. Or, simply mail a check to Temple Emanuel designated for the Tzedakah Fund. Regardless of the amount you are able to contribute, you can take satisfaction that a generous Temple Emanuel family or organization will match your contribution dollar per dollar up to a total of $250 per month for the entire fund. If you cannot contribute financially, please consider volunteering at RAM House, participating in the Interfaith Hospitality Network (IHN), tutoring at Virginia Heights Elementary School, or participating in another worthwhile organization or project, whether sponsored by Temple Emanuel or simply selected by yourself. Members of Temple Emanuel volunteer to prepare food at RAM House on the second Sunday of each month. Temple congregants also provide hosting and other support services for IHN on a regular basis. Phone or email the Temple Office for details. As a member of Temple Emanuel, you can make a difference in the quality of life for our fellow human beings. Instead of assuming that someone else will contribute funds or volunteer, make the effort yourself to be part of the process of Tikkun Olam: healing the world. The Caring Committee consists of a group of congregants who serve to meet the needs of families within the Temple who could use a helping hand. Services provided range from bringing meals to members of the congregation during sickness to offering companionship, or simply a friendly phone call or card when it is needed. Some members of the Committee provide hospital visits to the sick or offer transportation. The Committee's "inreach" seeks to meet the needs of our congregants at all times – but particularly during difficult ones. If you are interested in serving on the Committee, contact the Temple Office, which can put you in touch with Frank Friedman, Chair of the Committee. Please help us to reach out to our congregants in need! If you know of a congregant who is ill or having a difficult time, please call the Rabbi or Temple Office and make sure that we know. We want to be present for all of our congregants but especially for those in times of need. Your assistance is truly appreciated! Our MiShebeirach Program has expanded! Special MiShebeirach Cards will now be available at the Temple during the week and at Shabbat services. The cards have a place for you to indicate the name of an ill person, his/her condition, the name of the person filling it out, and your relationship. There will be an additional line asking if the person would like the name to be published in a new MiShebeirach section of the Rabbi’s weekly e-mail and/or the Temple Bulletin. Rabbi Cohen will also be saying the MiShebeirach for these people on a daily basis. If you are unable to come to the Temple, but would like a card filled out, please contact the Temple Office by email or phone. Each month our congregation adopts a group that helps others, and together we fulfill the Mitzvah of Tzedakah. As Jews, it is one of our most important duties to make the world a better place. Please give generously to our Tzedakah box. This wonderful organization helps to meet the needs of local military families. We thank Lawrence and Sheila Levinson and Melissa and Doug Wohlstein for sponsoring this month's tzedakah. The URJ offers resources for ethical eating. You can eat healthy, delicious food while promoting Tikkun Olam! Here's how you can help.